This award is fantastic. It was given to a store representative in 1993 for 'Going the Extra Mile' (which is inscribed on the back with the recipient's name) and is one of my favorite pieces of my collection. Though I'm sure there are other awards like this in existence, this is the only one I have ever seen. I would link the auction, but I don't want the original owner to possibly be hounded for any other possible potential internal items. 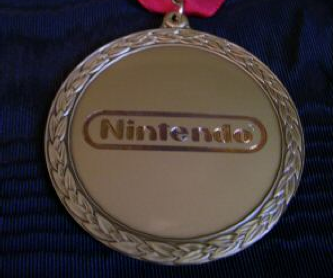 Just know that the reason this went so cheap and under the radar was because the seller accidentally spelled the word Medal as 'Metal'.